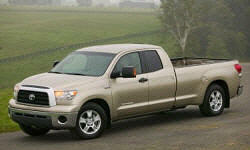 See TSBs and recalls for the 2013 Toyota Tundra. US $367 Poor braking performance. Shuddering from front end during braking. Rotors were either warped or had hot spots. Dealer tried cutting the rotors but that did not cure the shuddering. Replacing the rotors and pads cured the problem. US $450 Power steering pump came loose. This caused the drive belt to come off. Repairman stated pump was not bolted down properly and eventually worked it's way loose. This part has never been replaced before, so this was an error made when this truck was assembled new. 450 mi Ck Engine and Stability Control Lights were flashing intermitenly. Control module was "re-flashed" and problem disappeared. Entire cost covered under warranty. 1400 mi Cam following seals were leaking and replaced under warranty. 77000 mi Vehicle was hard to start at times. Needed fuel system recalibrated. See our lemon odds and nada odds page to see vehicles with no repairs or vehicles with more than three repairs. 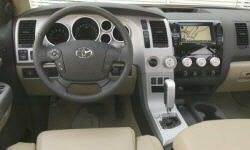 To see how frequently 2013 Toyota Tundra problems occur, check out our car reliability stats.